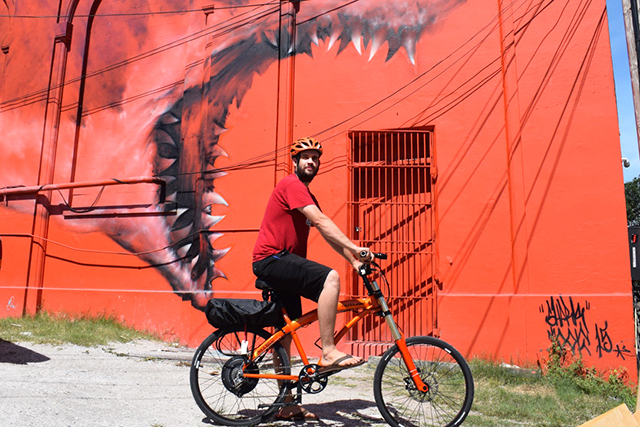 Every time I see a brightly-colored cruiser-style bicycle rolling down the streets of sunny St. Pete, I get major FOMO. I want a shiny new bicycle. But those shiny cruisers — the super-glossy three-speeds I’ve been eyeing — start at about $200. And since I’m just looking for a bike that will get me to the library and back, I’m not not sure it’s worth paying for a brand-new bike. But shopping for a used bike? It feels like a minefield. Am I going to get a “great” deal on Craigslist, only to discover the bike needs hundreds of dollars of work to make it rideable? Or worse — how do I know a bike hasn’t been stolen by some shady dude trying to make a quick buck? More than 200,000 bikes are stolen each year, according to the FBI. I don’t want to make the statistics worse by getting a great deal on someone else’s misfortune. It was time to get educated. Can You Trust These Internet Bikes? 1. Listings for bikes in great condition, with a ton of photos and information about the make, model, and owner history. These bikes typically look pretty new, priced at $50-$100 less than retail. 2. Listings for bikes that may or may not mention the make, model or size of the bike. There are only one or two photos and maybe a short statement about the bike. These bikes are priced as low as $35. I called Bryan Hance, who founded StolenBicycleRegistry.com in 2004 after having five bikes stolen in nine years. He merged that site with Seth Herr’s Bike Index in July 2014 to help bike owners both register their bikes and help recover them if ever stolen. Hance has seen it all. Bike Index even created an infographic to prevent Regular Janes like me avoid unwittingly purchasing a stolen bike. It only takes a little bit of knowledge to know a bike has been tampered with and may be stolen. For example, if you see a comfortable, wide seat on a racing bike, Hance said, that’s a red flag. Most bicycle tires come in sets, so if the front and back tire don’t match, that’s another red flag. “The first two things someone does after they steal a bike is switch the seat and switch the tires,” Hance said, as those parts are often most recognizable. Next: hiding any distinctive colors on the bike, like covering colorful handlebar tape with plain black. “Beyond that, you kind of have to be a bike person” to know if a bike is stolen, Hance said. Your best bet is to check the bike’s serial number, usually located on the bottom of the frame, against Bike Index or call your local police department. Hance noted that newer person-to-person sales sites like Letgo and OfferUp seem to have a higher rate of stolen bikes listed than Craigslist. There are also a few mechanical issues you should look out for, Ken Fong of Northeast Cycles in St. Petersburg said. If you’re meeting someone you met online about buying a bike, the test ride is crucial. It’s not worth taking a risk buying a bike sight-unseen. A word about safety: this is not the time to drive to some far-flung garage to maybe buy a used bike. Hance said a highly-trafficked area is essential for meeting someone to view a bike for sale. “Some cities have gotten wise and set up Craigslist trading areas,” well-lit places — sometimes at police stations — where folks can set up meetings, Hance explained. But for all the internet’s risks, it’s full of trading gems. Neighborhood yard-sale groups on Facebook can help you avoid running all over town trying to chase down a deal. Some towns even organize community bikes sales and swaps to provide a safe space doing business. Many universities host similar sales at the end of the semester, after all the abandoned bikes have been removed from bike racks. If you’re not up for the challenge of scouting the perfect bike on your own, bike shops are the easiest option — especially if you’re not sure what type or size bike you need. A pro can help you determine the best bike style for whether you’re going to be biking to do errands or planning to conquer the trails. Bike shops are a consistently reliable source of used bikes. Depending on the city and state, bike shops that offer used steeds are often held to the high standards, meaning all incoming and outgoing used merchandise needs to be cataloged through a computer system that checks police or pawn shop databases. Fong said his shop runs all serial numbers to check for theft before buying a used bike from someone to resell in his shop. Once a used bike enters the shop’s inventory, it gets a thorough cleaning and inspection before getting a price tag. That customer service can go a long way. Hance also noted that a used bike shop will usually offer deals on tuneups or other services when you buy a bike — new or used — from them. So there’s an incentive to get to know your local bike shop. No matter how little you spend on your actual bike, save room in your budget to buy a U-lock. “Cable locks are pointless,” Hance said. “It’s like tying your bike up with floss.” He recommended spending $60 to $70 on a good lock. “Well, if a good bike thief only needs one second, a bad thief only needs five,” he said. Then, register your bike. Some police departments offer their own registry, while others will direct you to the National Bike Registry, which charges $10 to register your bike for 10 years. Hance’s Bike Index is free. “Whip out your phone, take some pictures, write the serial number down, register and forget it,” he said. Even photos of insignificant things can help. You might not care about the scratch on the body of the used bike you bought, but documenting can help increase the chances of finding it if it’s ever stolen. Your Turn: Do you own a bike? Is it new or used? Lisa Rowan is a writer and producer at The Penny Hoarder. Editorial intern Jacquelyn Pica contributed to this article.